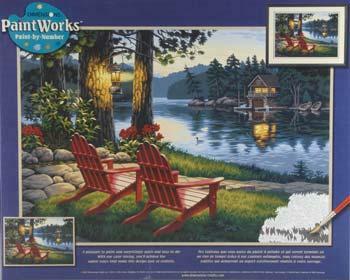 "Loved the painting when completed"
The design is preprinted on a canvas artboard, and comes with a separate numbered practice guide High quality, quick-drying, non-toxic acrylic paints A PaintWorks No. 1 paintbrush Instructions, helpful hints and techniques provided Made and printed in the USA!. "Love this painting. help Lost instruction sheet"
I am in the middle of this and got to the mixing part -can anyone post a picture of the instruction sheet? or email lolisajoy@gmail.com thanks. ! love this painting. Picture came out looking like a postcard. I found it easy to paint. I enjoy the dimension products because they come out looking so real. I am looking forward to hanging this one on the wall. "if you&apos;re considering it, go fo it!" This painting was challenging and relaxing, and the final results were awesome. I love the colors, the layout, the lighting. This is definitely been one of my favorites, and id considering ordering it again.